Lying at an altitude of 2590 meters and a distance of 13 kilometres away from the Darjeeling, Tiger Hill is most famous for its splendid sights of sunrise from where you can see the peaks of Kanchenjunga illuminate before the sun is seen at lower elevations. The magnificent view of snow-capped mountains sitting amidst cotton clouds attracts tourists to Tiger Hill from all over the country. Interestingly, this is also the summit of Ghoom, which is the highest railway station in the Darjeeling Himalayan Railway, a UNESCO World Heritage Site. This vista point of Tiger Hill in Darjeeling is a pristine natural beauty where you can enjoy the virgin charm of the exotic hill station in its most endearing form. At sunrise, the peaks of Kangchenjunga are illuminated before the sun is seen anywhere else in the city, which is an amazing thing to experience. Another notable thing of beauty here is the pristine natural beauty of Tiger Hill, which is enveloped in gentle verdant foliage coupled with sublime clouds in the background. The fresh morning air as you make your way to the summit is a refreshing experience away from the banter of city life. If you want to witness the first rays of sun hitting the twin peaks of Kangchenjunga, along with a panoramic view of Everest peeping through the peaks standing by its side, then Tiger Hills make for a perfect sunrise viewing point for you. 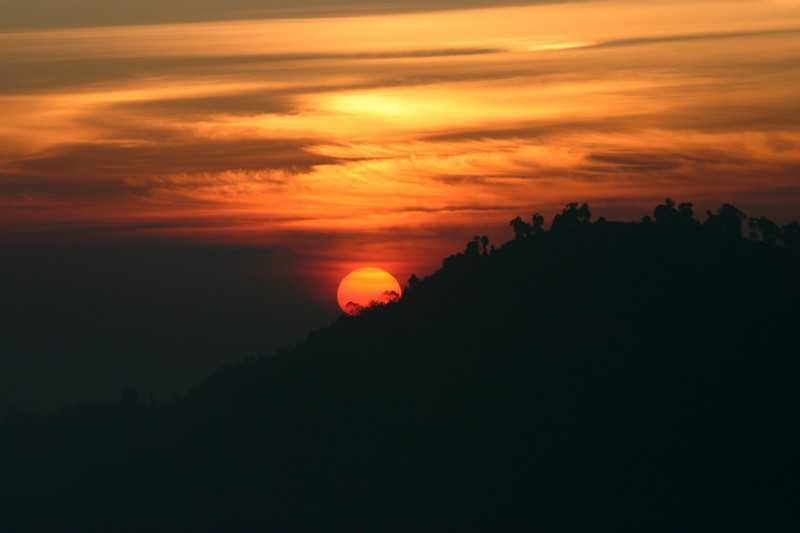 Perhaps the splendid sunrise through the peaks is what makes it one of the must-visit places in Darjeeling. The summit of Ghoom is the highest point of Tiger Hill which is famous for the amazingly beautiful view of the Mount Everest and Mount Kanchenjunga. The first shot of sunlight at dawn makes the tip of the snow clad mountain in pale orange, a sight not worth missing. The gradual appearance of the morning sun disperses a gentle orange light to the shadowy hills, which turns into a blazing yellow brightness in a matter of minutes. Don't forget to commemorate the trip with some snacks from local shops nearby, where women wearing traditional clothing dish out the most delectable 'pakoras', 'samosas' and tea. Tiger Hill offers one of the most beautiful panoramas of the Greater Himalayas. Kanchenjunga, the third highest peak in the world, is lit up at sunset and sunrise in a mesmerising display of colours. Mt Everest and several other mountain peaks belonging to the 8000+m club can be easily seen from this hilltop. You can even spot the town of Kurseong on a day with clear weather as well as the rivers to the south viz. Teesta, Mahananda, Mechi and Balason. Best time to visit the Tiger Hill would be from Mid October to December, where you can witness the snow-covered mountains in their full glory. Tiger Hill is situated 13 kilometres away from the city and can be easily accessed through roadways from Darjeeling. The nearest major railway station to Tiger hill is Siliguri Junction Train Station which is 33 km away. There are roads leading up to the base of the hill can be navigated using a jeep through Chowrasta, Alubari or Jorebangla. After this, there is a climb to the summit that has to be covered on foot.